As I write, I think I am about to die in some horrific way. I am trying to get some sleep in a place called Samoeng Resort, just outside a small town in the middle of nowhere up a mountain. The resort has about 30 or so individual bungalows spread across a wide area, but it seems my partner and I are the only people here . . . all horror movies start like this. Not sure where these came from but one of the few times we found traffic! 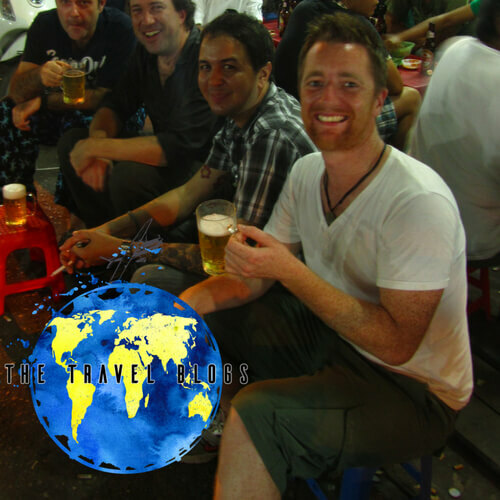 Due to some inefficient planning on my part we ended up with a little more time in Chiang Mai than we originally thought and had a couple of days with no plans. 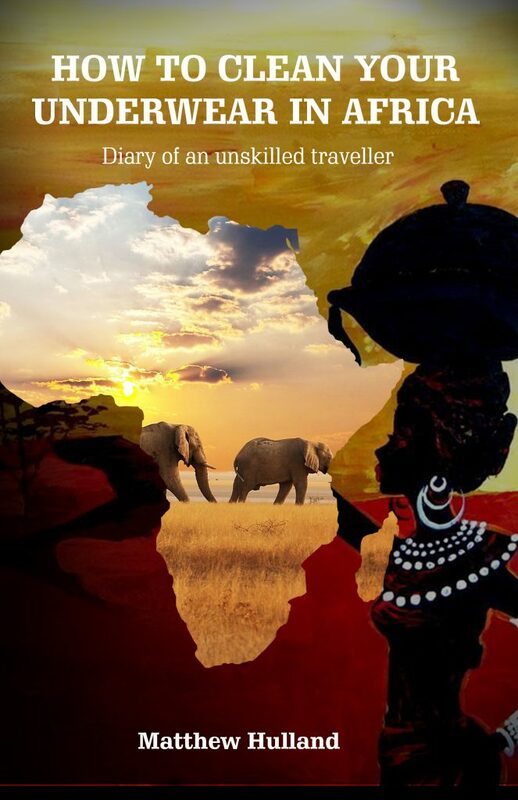 That was when I recalled a conversation I had had with a fellow traveller in Zambia. This man was on a year-long expedition and had covered most of South East Asia, India and now Africa travelling from North to South. As you do when you chat you get talking about highlights and he said from everywhere he’d been, motorbiking from Chiang Mai to Pai was one experience that he’d never forget, the views of never ending forest as you tackle hairpin after hairpin was unlike anything else he’d done so far. 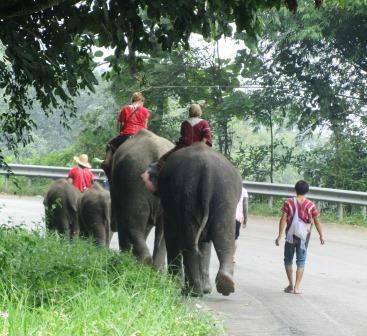 The one flaw to replicating this was that we were already booked on a bus to go to Pai in a couple of days’ time. Undeterred, I looked into other options and discovered the Samoeng Loop, by all accounts a fantastic alternative. The Samoeng Loop is a . . . well . 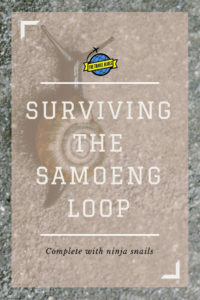 . . the clues in the name, it takes you through a region called Samoeng and is a loop. If you are unsure of the meaning of loop, it starts and ends in Chiang Mai. 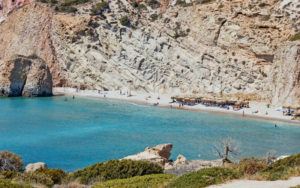 The loop is quite well known and while there is a rough suggestion, there are so many options of how to do it so you can make it your own. Many people do it in one day but we decided to break it up with an overnight stop, I’m starting to regret that. If you would like more in-depth information about the loop, check out my guide: What to do on the Samoeng Loop. Anyway, the day started off great. 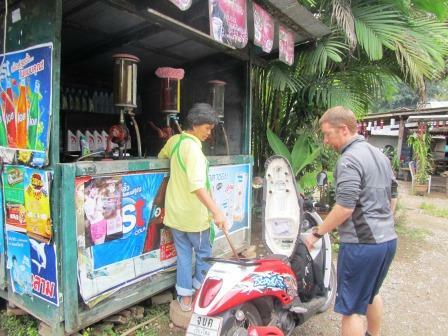 We sorted out the moped yesterday meaning we could have a quick breakfast and get straight onto the road. 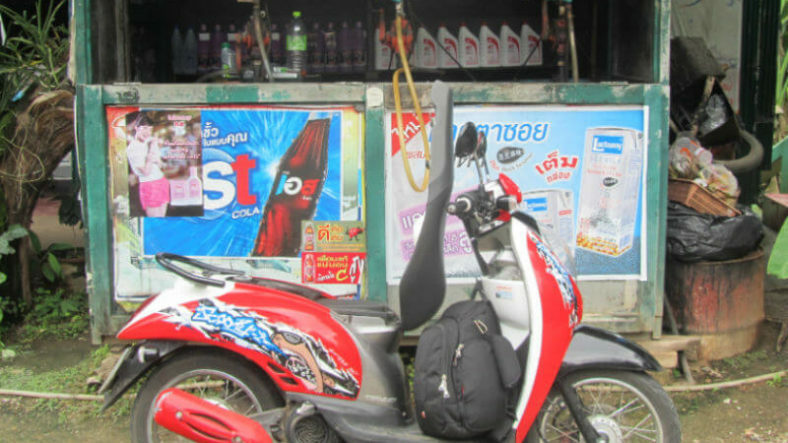 There are loads of places that rent bikes in Chiang Mai for but remember cheapest isn’t always best, just Google Thailand moped hire scams and you’ll see why. Heading north it wasn’t long before we decided to make our first stop. As we turned off the main road onto the 1096 towards the mountains, we stumbled upon an elephant place and decided to check it out. It was called Maesa Elephant camp and I plead you, do not go there. Had I done a little research rather than accidentally finding it I wouldn’t have bothered to visit. While they promise loads it is rather obvious that the elephants are not looked after well and the training comes in a malicious form. After a couple of hours mopedding, enjoying the switchback corners and endless mountain viewpoints we arrived at the Samoeng Resort. It took a lot longer than it should have to find someone working, but we managed to in the end and were shown to our bungalow. I think that in another lifetime this was a thriving resort full of happy families. It has the feeling of a small community (very small today) with plenty of space for kids but it has fallen into disrepair. Maybe it does still thrive and we are just visiting out of season. Today the site is messy and the bungalows have that look of tiredness where walls look as if they are using every last ounce of strength they have left into just staying upright. The room is a little musty with an off yellow colour to the walls. The bathroom is surprisingly nice and there’s a small TV in the corner but the mosquito netting is sporadic at best, meaning we have quite a few little visitors sharing the room with us tonight. Fuel stops loo a little different than what I was used to. I was scared to run the tank low! After dropping our small bag of essentials we got back on the bike and headed into the nearest town on a mission to find something to eat. I say town but I think that is overselling it somewhat, a street with a few shacks selling stuff is a more accurate description. No sooner had we set off that it started to rain, and boy did it pour down! By the time we made it we were soaking through. Our short sighted planning had meant that we only had the clothes that we were wearing (and fresh underpants) which were now soaked and unlikely to dry by morning but luckily among the shacks was a small clothes vendor and we were able to buy something for tomorrow. I am now the proud owner of a Buriram United football kit, I have no idea who they are but at least I now have a favourite Asian team. A couple of shacks up from the clothes shack was a snack shack where we were able to stock up with snacks from a nice old man who spoke a little English, before returning to “The Resort”. 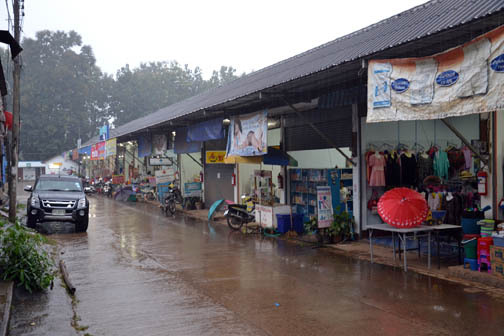 The row of shacks to welcome when wet! As we were sitting in bed I noticed something move behind my partners head. Being the hero I went on the attack, like a ninja I jumped out of bed and grabbed the offending creature without a thought for my own safety. It was quite a struggle, man vs beast but I emerged victorious and launched my foe out the front door. I doubt I’ll be seeing that snail again anytime soon. When asked what had just happened; I simply explained I just possibly saved your life, no biggie. As night time crept up, it was starting to feel quite eerie. I’m not sure if it was my mind playing tricks on me, but in the silence every small noise made my heart pound. I gave up reading and turned on the television hoping it would be a welcome distraction. Of the 70 channels on the TV only three worked and two of them were showing the same Thai karaoke. An hour or so later, just as I was getting into the show, the power went out . . . lights out, TV off, no staff around to help. I could feel a cool breeze through the room; it made the door shiver as if there is someone rattling it, trying to get in. I swear I could also hear footsteps outside. I bet this place is great when it’s busy but when it’s just us it’s quite unsettling. Love this story? Be sure to pin it using the share bar at the top! So that brings us to now, writing this with my iPad being my only source of light. I am finding every noise has been amplified even further in the darkness and I swear there are footsteps outside. What is making this spine-chilling experience even worse is that I can’t get the thought out of my head that I am in the middle of a horror movie. All the ingredients are here, two lone travellers in a deserted resort in the middle of nowhere, eerie weather, a creepy old man who asked where we were staying (although this man normally works at a petrol station in most horror movies rather than a snack shack), and now a power cut. What normally happens next in the movies is that the hero grabs a flashlight and goes to check the circuit breakers. Luckily we don’t have a flashlight, and despite my snail dominating prowess, I’m not a hero. Besides, they are normally one of the first ones to die. I have already tried to tell my partner my theory, but she just told me to shut-up and go to sleep. Another classic character in horror movies – the non-believer! Ha ha ha I’m stay there too. hahahaa! I love the ending… footste … are you still there? :p lol! Poor you! I admire your guts to stay at that resort. I think I would just run…oh wait I have no where to go. It is really scary and its like you were at the haunted house or something. Although it is not a good experience for you, but it makes for a very interesting read. I was hooked when I saw the title on your Facebook page. Haha thanks. I don’t think there were any guts involved, just stupidity! It was all good in the end though, glad you enjoyed reading. Hahahaha omg you really had all the elements. I’m such a scaredy-cat, I’d be equally scared. You’re such a good story teller, and I’ve been hooked the second i started to read! It’s not a fun experience but the snail vs man fight was hilarious! Lol, thank you. I’m not sure if I really conveyed the size of the snail, it was pretty big! 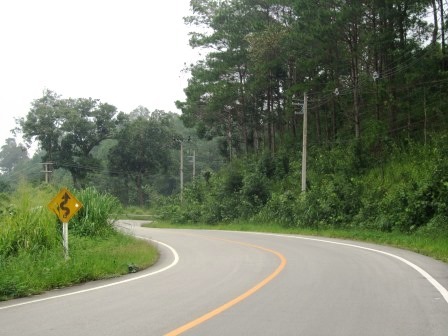 Northern Thailand is a great place to go on a ride. I did the mandatory Chiang Mai to Pai like everyone does. But you’re the only who I know of that has done. Ha! You indeed had a bit of a creepy experience. And I’ve had my share of such although not in Thailand. I left early in the morning and by evening I was back in Chaing Mai. Thanks. 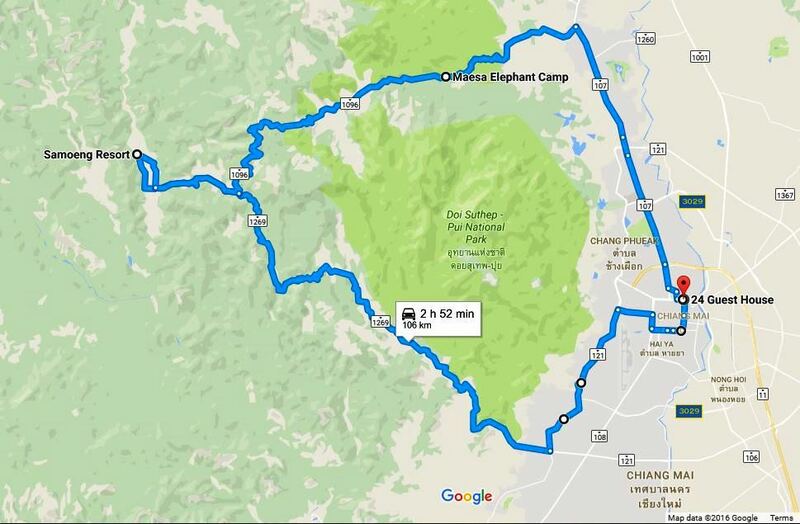 I also managed to do the ride to Pai at a later date. 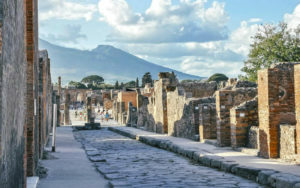 The area is simply stunning! It seems so scary. This is something new for me for I only know of Chiang Mai in general. However, I truly hope you are safe now and had a wonderful adventure instead of a different one. Hoping for the best for you. Thanks. It was a great mini adventure. I love the little side trips within trips. Haha fun – I know, the situation is not. But you´re a good story-teller. And to be honest, I could never sleep under these circumstances, way too creepy. Thank you. Looking back on it it was a lot of fun but genuinely unnerving at the time!